Easily - Convert FLAC Audio To MP3 Music Just In Only 3 Clicks. Fast - 180% faster than other audio Converter. Input - Support more than 20 media formats input. Output - Support MP3, WMA, WAV, AC3, AMR formats output. Batch Mode - Convert HUNDREDS of FLAC Songs to MP3 audio at One Time. [New] New version supports Unicode FLAC Files! 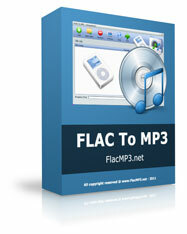 FLAC To MP3 is a windows converter application for converting Flac to MP3 audio quickly. 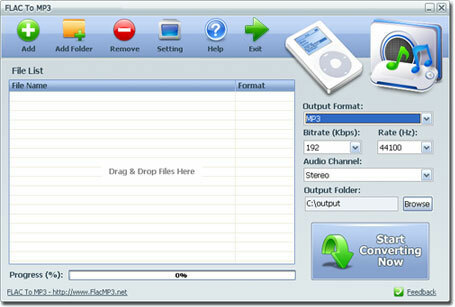 With the converter, users can convert FLAC music to MP3 audio format in few clicks. Also, the converter supports Batch Mode to convert hundreds of FLAC audio to MP3 music at one time. During the conversion, the program could keep the original metadata and tags as well, which means users will not lose the information of a song like album, producer, actor or age etc.